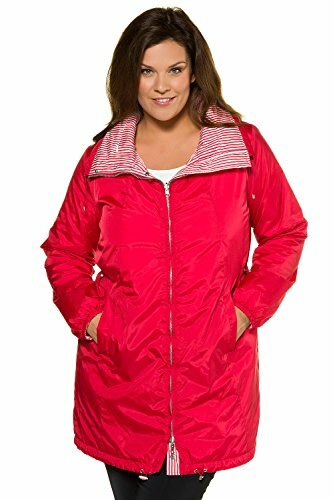 Feminine & fashionable waterproof jacket; designed exclusively for plus size women. Crafted from soft & lightweight windproof, breathable material, with reversible striped interiour. Features long sleeves, drawstring stand up collar. Elastic drawstring waist and hem, 2 welt pockets, and long sleeves with elastic cuffs. Size adjusted length, about 35½" - 36¼" for a great fit in every size. Stay snug and comfy & above all stylish this season in this feminine & fashionable waterproof jacket. Whether you are walking the dog or hitting the city streets, it is the perfect jacket for every day wear. With a reversible striped lining as well as a stand up drawstring collar and long sleeves to provide extra protection and help keep you comfortable, it also features a 2 way zipper front, elastic drawstring waist & 2 welt pockets. Essential for an active lifestyle, once you have tried it on this is one jacket you won't want to be without anymore. If you have any questions about this product by Ulla Popken, contact us by completing and submitting the form below. If you are looking for a specif part number, please include it with your message.